The map below shows where we stayed (Bormio) and the climbs that we completed in the Italian Dolomites. I have tried both ridewithgps.com and mapmyride.com, and neither of them allow me to map the route that we rode from Bormio to the top of Stelvio. It is quite simple. We literally road up the one road that goes to the top of the mountain. I have provided a really rough ‘line’ here to show you where the road is. Where to Stay – Stay in Bormio!!! 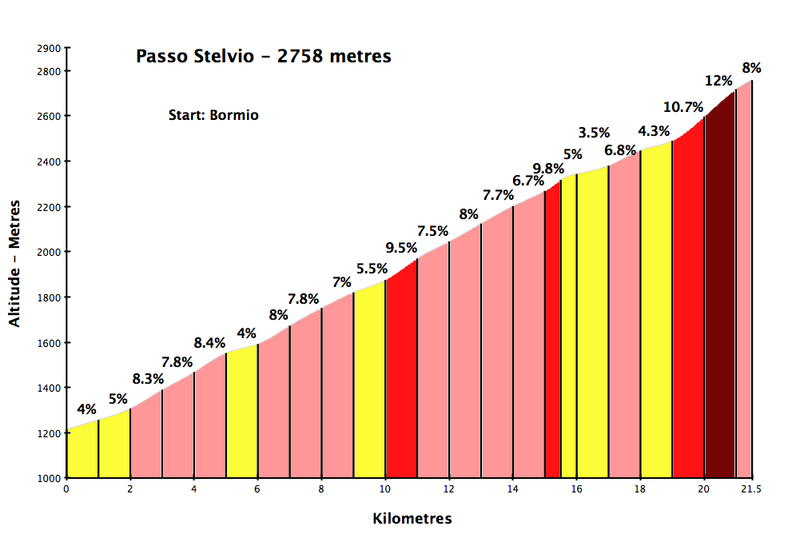 It is really easy to access the really famous climbs (Stelvio, Gavia, Mortirolo). Hotel – Say at Hotel Genzianella. It is amazing, and really oriented for the cyclist. There are facilities to clean and store your bike safely, an in house chef that will fuel you for your big climbs, and a welcoming, relaxed atmosphere. It is family run by two sisters. The Climb – Take a jacket…it tends to be cool at the top (at least in May and September). Be careful on the descent when approaching the tunnels, but don’t let them freak you out. Just get through them. Have a sausage at the top (many carts to choose from)! Buy yourself something from the vast array of souvenirs…when you are back home you can be drinking coffee from you mug and thinking back to the day you climbed Stelvio!! !